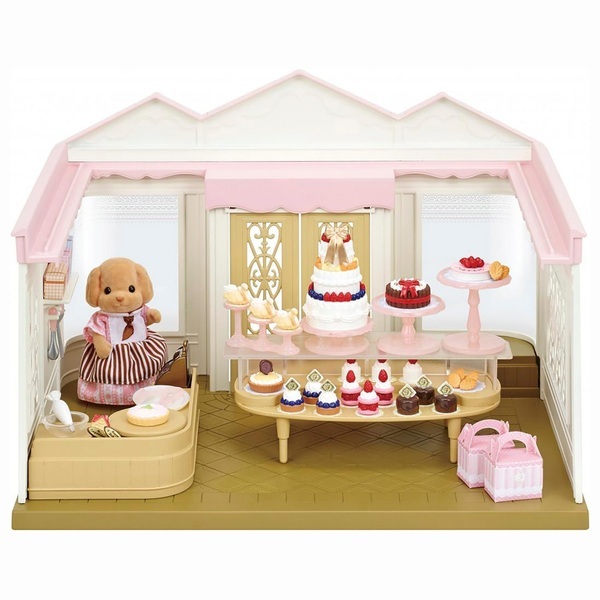 This Sylvanian Families Village Cake Shop Set comes with a charming cake shop with a delicious display window, a pretty-in-pink triangular roof and the Toy Poodle shopkeeper. And cake. Lots of cake! Help Veronica Cakebread whip up a real treat with this sweet set, which includes all of the equipment you need to get baking, including a piping bag, tongs and a whisk for mixing. From 11 varieties of cake to a choice of pretty gift boxes, this set comes with 90 pieces guaranteed to make your Sylvanians’ tummies rumble. You’ll even have the chance to decorate your own cakes, using the strawberries and decorations from the set. Contents: A cake shop, Toy Poodle shopkeeper (mother), roof, display case, display table, kitchen, cash register, cake stands x 3 (small, medium, large), cake stand (3 levels), 3-layer cake (large, medium, small), Charlotte cake, strawberry mousse, peach tart, custard tart, cake box x 2, gift box x 3 (A, B, C), swan cream puff x 3, macaron cake x 3, blueberry tar x 3, chocolate cake x 3, cream cake x 3, leaf pastry x 6, ribbon, cream piping bag, bowl, tray, strawberry x 6, decoration x 4, logo plate x 6, tongs, whisk, palette knife, lace paper (large x 3, medium x 3, small x 17) and a Story Book.